A UK Cathedral has been wrapped in a giant red ribbon this week to highlight National Transplant Week and the fleshandblood campaign. 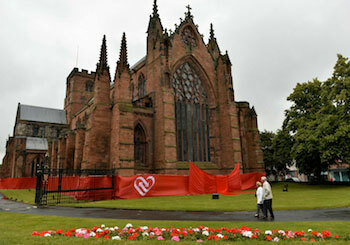 Carlisle Cathedral agreed to host the ribbon on its exterior to lend its support to the campaign and highlight the cause. The ribbon, which measures 200 metres long and is 2.5 metres high, took four hours to install by a team of seven people, also includes a giant bow that is positioned in front of the historic East Window. The stunt was designed to profile the fleshandblood campaign, the first partnership of its kind between the NHS and UK churches. This unique initiative aims to encourage church congregations to see blood and organ donation as a part of their regular giving, as around three people die each day in need of an organ transplant. It also seeks to equip people as advocates for blood and organ donation, enabling them to raise awareness of the need for donors with their family, friends and community, potentially helping to save thousands of lives each year. As part of the morning’s photo stunt the Cathedral also hosted a key presentation which focused on the purpose of the campaign and the urgent need for blood and organ donors in the UK. The presentation included speeches by The Rt Revd James Newcombe (the lead Bishop on healthcare for the Church of England), Anthony Clarkson (Assistant Director of Organ Donation and Nursing for NHS Blood and Transplant), and The Very Revd Mark Boyling (Dean of Carlisle Cathedral). The fleshandblood campaign has already witnessed widespread support across churches, community groups and from government ministers, with more than 35,000 church leaders across the country having been resourced. The impact has been so great that other faith groups working on similar concepts are also being supported by the organisers of the campaign. The fleshandblood campaign has been sponsored by Give.net in association with denominations and organisations including the Church of England, The Salvation Army, Methodist Church, United Reformed Church, Baptist Union, Church In Wales, Church of Scotland, Church in Ireland, Methodist Church in Ireland, Seventh Day Adventist Church, Hope and Evangelical Alliance.